Get acquainted with Bali’s natural and historical treasures on a private full-day tour to the UNESCO-listed Jatiluwih Rice Terraces and Munduk Waterfall from Kuta. Alongside a personal guide, you’ll gaze at the lakeside spectacle of Pura Ulun Danu Bratan and enjoy the powerful cascades of the Munduk Waterfall. Then, absorb the verdant splendor of the UNESCO-listed Jatiluwih Rice Terrace before you visit one of Bali’s most important religious structures, Taman Ayun Temple. 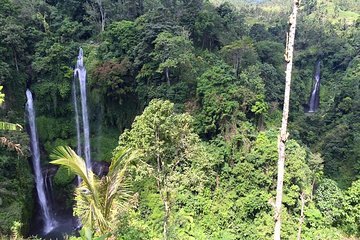 On this comprehensive tour, you’ll receive undivided attention from your guide while seeing the best of Bali. Had a hard time communicating with our guide but he seemed nice. Jatiluwih is breathtaking and so are the water temples. We skipped Munduk Waterfall as it seemed so far and opted to go to Uluwatu which is nearer our hotel drop off. This was one of the best tours we've been on, we had a fantastic day out. Pity is the best guide in Bali. I had the most fantastic day! The places were beautiful and my guide was so helpful, cheerful and informative! Would definitely recommend!